1 A None No Power Seat 1 A is a standard bulkhead seat, although many passengers find the legroom to be limited. Proximity to the lavatory and galley may be bothersome. There is no floor storage during takeoff and landing. 1 B None No Power Seat 1 B is a standard bulkhead seat, although many passengers find the legroom to be limited. Proximity to the lavatory and galley may be bothersome. There is no floor storage during takeoff and landing. 1 C None No Power Seat 1 C is a standard bulkhead seat, although many passengers find the legroom to be limited. Proximity to the lavatory and galley may be bothersome. There is no floor storage during takeoff and landing. 1 D None No Power Seat 1 D is a standard bulkhead seat, although many passengers find the legroom to be limited. Proximity to the lavatory and galley may be bothersome. There is no floor storage during takeoff and landing. 10 A None No Power Seat 10 A is a standard Club Europe seat. 10 B None No Power Seat 10 B is a standard Club Europe seat. 10 C None No Power Seat 10 C is a standard Club Europe seat. 10 D None No Power Seat 10 D is a standard Club Europe seat. 11 A None No Power Seat 11 A is a standard Club Europe seat. 11 B None No Power Seat 11 B is a standard Club Europe seat. 11 C None No Power Seat 11 C is a standard Club Europe seat. 11 D None No Power Seat 11 D is a standard Club Europe seat. 12 A None No Power Seat 12 A is a standard Club Europe seat. 12 B None No Power Seat 12 B is a standard Club Europe seat. 12 C None No Power Seat 12 C is a standard Club Europe seat. 12 D None No Power Seat 12 D is a standard Club Europe seat. 13 A None No Power Seat 13 A is a standard Club Europe seat. 13 B None No Power Seat 13 B is a standard Club Europe seat. 13 C None No Power Seat 13 C is a standard Club Europe seat. 13 D None No Power Seat 13 D is a standard Club Europe seat. 14 A None No Power Seat 14 A is a standard Euro Traveller seat. 14 B None No Power Seat 14 B is a standard Euro Traveller seat. 14 C None No Power Seat 14 C is a standard Euro Traveller seat. 14 D None No Power Seat 14 D is a standard Euro Traveller seat. 15 A None No Power Seat 15 A is a standard Euro Traveller seat. 16 A None No Power Seat 16 A is a standard Euro Traveller seat. 18 A None No Power Seat 18 A is a standard Euro Traveller seat. There is no overhead bin storage for this seat because it is usually used for crew and safety equipment. 18 B None No Power Seat 18 B is a standard Euro Traveller seat. There is no overhead bin storage for this seat because it is usually used for crew and safety equipment. 18 C None No Power Seat 18 C is a standard Euro Traveller seat. There is no overhead bin storage for this seat because it is usually used for crew and safety equipment. 18 D None No Power Seat 18 D is a standard Euro Traveller seat. There is no overhead bin storage for this seat because it is usually used for crew and safety equipment. 19 A None No Power Seat 19 A is in the last row of this aircraft and has limited recline. Proximity to the lavatory and galley may be bothersome. There is no overhead bin storage for this seat because it is usually used for crew and safety equipment. 19 B None No Power Seat 19 B is in the last row of this aircraft and has limited recline. Proximity to the lavatory and galley may be bothersome. There is no overhead bin storage for this seat because it is usually used for crew and safety equipment. 19 C None No Power Seat 19 C is in the last row of this aircraft and has limited recline. Proximity to the lavatory and galley may be bothersome. There is no overhead bin storage for this seat because it is usually used for crew and safety equipment. 19 D None No Power Seat 19 D is in the last row of this aircraft and has limited recline. Proximity to the lavatory and galley may be bothersome. There is no overhead bin storage for this seat because it is usually used for crew and safety equipment. 2 A None No Power Seat 2 A is a standard Club Europe seat. 2 B None No Power Seat 2 B is a standard Club Europe seat. 2 C None No Power Seat 2 C is a standard Club Europe seat. 2 D None No Power Seat 2 D is a standard Club Europe seat. 3 A None No Power Seat 3 A is a standard Club Europe seat. 3 B None No Power Seat 3 B is a standard Club Europe seat. 3 C None No Power Seat 3 C is a standard Club Europe seat. 3 D None No Power Seat 3 D is a standard Club Europe seat. 4 A None No Power Seat 4 A is a standard Club Europe seat. 4 B None No Power Seat 4 B is a standard Club Europe seat. 4 C None No Power Seat 4 C is a standard Club Europe seat. 4 D None No Power Seat 4 D is a standard Club Europe seat. 5 A None No Power Seat 5 A is a standard Club Europe seat. 5 B None No Power Seat 5 B is a standard Club Europe seat. 5 C None No Power Seat 5 C is a standard Club Europe seat. 5 D None No Power Seat 5 D is a standard Club Europe seat. 6 A None No Power Seat 6 A is a standard Club Europe seat. 6 B None No Power Seat 6 B is a standard Club Europe seat. 6 C None No Power Seat 6 C is a standard Club Europe seat. 6 D None No Power Seat 6 D is a standard Club Europe seat. 7 A None No Power Seat 7 A is a standard Club Europe seat. 7 B None No Power Seat 7 B is a standard Club Europe seat. 7 C None No Power Seat 7 C is a standard Club Europe seat. 7 D None No Power Seat 7 D is a standard Club Europe seat. 8 A None No Power Seat 8 A is a standard Club Europe seat. 8 B None No Power Seat 8 B is a standard Club Europe seat. 8 C None No Power Seat 8 C is a standard Club Europe seat. 8 D None No Power Seat 8 D is a standard Club Europe seat. 9 A None No Power Seat 9 A is a standard Club Europe seat. 9 B None No Power Seat 9 B is a standard Club Europe seat. 9 C None No Power Seat 9 C is a standard Club Europe seat. 9 D None No Power Seat 9 D is a standard Club Europe seat. For Club Europe passengers, British Airways offers a choice of refreshments and a menu that has a selection of hot and cold dishes, suited to the time of day and length of flight. Complimentary drinks, including champagne, are also available. For Euro Traveller passengers, British Airways serves breakfast with coffee and tea. Complimentary snacks and drinks are served throughout the rest of the day. BA CityFlyer, a British Airways subsidiary, flies the Embraer 170 European from London City airport to destinations across Europe. Its flight range is 3,334km (2,072 miles). There are six Embraer 170s in the fleet and they seat a total of 76 passengers. All B and C seats have moveable armrests. BA charges £18 for this row as its deemed an emergency exit row. However there is NOTHING in the row that's different from any other, except that the seat doesn't go back the same as the others. Also note that the overhead bin *may* be used by the flight crew as its designated for emergency equipment (label on the bin). However it was empty and my bag was allowed in it. A great seat with a fantastic amount of legroom. Tray table is in the arm rest, but did not affect the width of the seat very much. Window was slightly mis-aligned to the seats which was a shame, but a very comfortable seat. Small plane but comfortable seats, quite wide and with no foot hindrances. 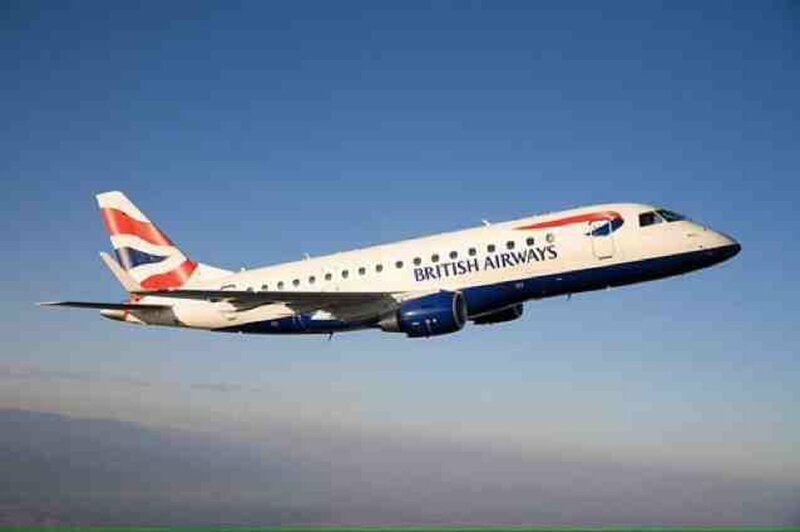 British Airways flies 2 versions of Embraer 170.